KUALA LUMPUR, Dec 20: Malaysian International Furniture Fair (MIFF), the largest of its kind in Southeast Asia, is set to feature a greater variety of new and innovative products from a wide range of suppliers and four country halls at its 23rd annual edition coming March. Organised by UBM Malaysia, MIFF 2017 is again fully-booked and pre-registered visitor numbers are running strong for the four-day event taking place at Putra World Trade Centre (PWTC) and MATRADE Exhibition and Convention Centre (MECC) from March 8 to 11. The trade show which posted record US$908 million sales in 2016 will feature 500 companies and attract an estimated 20,000 buyers from 140 countries and regions. MIFF 2017 continues to benefit from the cross-promotion of the trade show across UBM an Alibaba.com platforms as a result of a strategic "online and offline" collabor tion to create the next generation of B2B trade sourcing experiences. Around 70 per cent of exhibitors are Malaysian companies while the rest are from overseas including from China, Taiwan, Japan, Indonesia, South Korea and Vietnam. "There will be a lot of new products releases during MIFF 2017 based on the product range indicated by exhibitors. The new products and design are very refreshing, this is great for buyers. Many companies are seeing this as an opportunity to boost their visibility and increase business leads because they want a bigger footprint in 2018 when MIFF expands to 100,000 sqm at the new Malaysia International Trade and Exhibition Centre (MITEC) and PWTC. We are also seeing very good numbers from pre-registration from over 100 countries so far," said MIFF General Manager Ms Karen Goi. MIFF 2017 will feature a dedicated segment -- MIFF OFFICE -- to showroom the biggest range of office solutions with 130 companies at PWTC. Malaysian companies which would be participating in MIFF 2017 include well- known exporters such as Merryfair Chair System, Euro Chair, Poh Huat, Soon Her Sing Industries, Oasis Furniture and Safari Office System. The China Hall will be larger with over 150 companies as more furnishing exhibitors are coming from southern Guangdong province led by the China Council for the Promotion of International Trade, Guangzhou Council (CCPIT Guangzhou). "We are bringing more exhibitors to MIFF 2017 because it is a proven platform for our companies to showcase their products to global buyers. The trade show plays a vital role for our companies to reach out to more markets, understand global trends and the advantages of other exhibitors. The valuable experience has helped our companies to better develop their business, how to get new customers and open up more markets. MIFF is strongly supported by CCPIT and it has a 70% rebooking rate from Chinese exhibitors, that's the highest in any international trade show participated by Chinese companies." "Our company was established in 2001 and we took part in our first international exhibition in MIFF in 2002. It was a great debut and we've been back ever since. 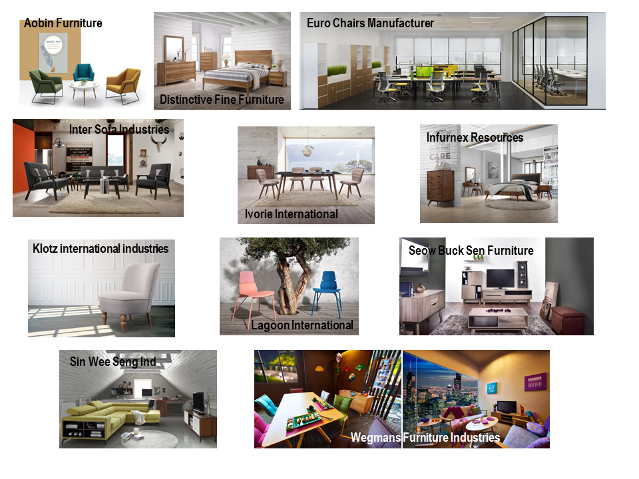 The huge difference between MIFF and other exhibitions is that it has a diversity of buyers coming from different regions of the world and groups of core buyers seeking a particular category of product like wood furniture. This helps us to target the markets and facilitate the delivery of orders. We have now extended our customer network beyond Europe to other countries from the business we get in MIFF." We are very excited at the coming show because our exhibitors had achieved very good sales in 2016. MIFF has given a big opportunity for local manufacturers to discover new business and develop international networks because of its global standing. This is very important for manufacturers like us because Malaysia's furniture industry is an export sector and Muar is the biggest production hub in Malaysia. We expect to have a busy time again." Malaysian International Furniture Fair (MIFF) is an export-oriented furniture trade show held annually in Kuala Lumpur, Malaysia. It is also a global leading trade show approved by UFI, The Global Association for Exhibition Industry. Since 1995, MIFF has nurtured invaluable partnerships between thousands of buyers and furniture makers across the globe.